Bataković, Dušan T. (编). 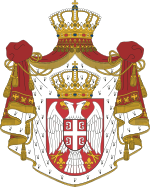 Histoire du peuple serbe [History of the Serbian People]. Lausanne: L’Age d’Homme. 2005 （法语）. Ćirković, Sima. The Serbs. Malden: Blackwell Publishing. 2004. Curta, Florin. Southeastern Europe in the Middle Ages, 500–1250. Cambridge: Cambridge University Press. 2006. Dvornik, Francis. The Slavs in European History and Civilization. New Brunswick: Rutgers University Press. 1962. Fine, John Van Antwerp Jr. The Early Medieval Balkans: A Critical Survey from the Sixth to the Late Twelfth Century. Ann Arbor, Michigan: University of Michigan Press. 1991 . ISBN 0-472-08149-7. Fine, John Van Antwerp Jr. The Late Medieval Balkans: A Critical Survey from the Late Twelfth Century to the Ottoman Conquest. Ann Arbor, Michigan: University of Michigan Press. 1994 . ISBN 0-472-10079-3. Ivić, Pavle (编). The History of Serbian Culture. Edgware: Porthill Publishers. 1995. Orbini, Mauro. Il Regno de gli Slavi hoggi corrottamente detti Schiavoni. Pesaro: Apresso Girolamo Concordia. 1601. Орбин, Мавро. Краљевство Словена. Београд: Српска књижевна задруга. 1968. Pavlovich, Paul. The History of the Serbian Orthodox Church. Serbian Heritage Books. 1989. Pavlowitch, Stevan K. Serbia: The History behind the Name. London: Hurst & Company. 2002. Popović, Svetlana. The Serbian Episcopal sees in the thirteenth century (Српска епископска седишта у XIII веку). Старинар. 2002, (51: 2001): 171–184. Samardžić, Radovan; Duškov, Milan (编). Serbs in European Civilization. Belgrade: Nova, Serbian Academy of Sciences and Arts, Institute for Balkan Studies. 1993. Sedlar, Jean W. East Central Europe in the Middle Ages, 1000-1500. Seattle: University of Washington Press. 1994. Soulis, George Christos. The Serbs and Byzantium during the reign of Tsar Stephen Dušan (1331-1355) and his successors. Washington: Dumbarton Oaks Library and Collection. 1984. Winfield, David. "Four historical compositions from the medieval kingdom of Serbia." Byzantinoslavica 19 (1958): 251-78.